Electric Locks provide a faster and more convenient way to unlock and open a door. Many consumers are opting for this new technology for both convenience and safety. Consumers don’t mind paying convenience. Perhaps this is why so many are choosing to have more high-security locks installed, such as, electric locks. Gallup reported that approximately one year ago, property crimes in the United States decreased by 7.5 percent from the previous year. This decline is due, in part, to the increase in the number of electric locks being used by homeowners today. 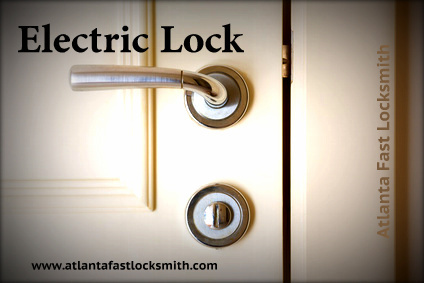 Two of the most widely used residential electric locks installed by Atlanta Fast Locksmith are the push-button lock and the wireless lock. Without the need for a key, a push-button lock requires that the exact code be entered into the keypad. Upon entering the correct code, an electronic signal is sent to the lock, which allows it to open. This type of lock is designed with magnets or internal motors that engage the lock feature. It is a popular choice for consumers because it is easily programmable. Whenever you need to prevent someone with the current code from gaining access, you can quickly change the code on the push-button lock. Wireless locks are just as popular as the push-button lock since no key is required. It is a battery-powered mechanism that uses Bluetooth technology. This type of lock requires a key fob in order to disengage the lock. Once the key fob is programmed with the specific lock, it only requires the user to wave it in front of the lock in order for it to open. Wireless locks were once only used in commercial establishments but with recent advances in technology it is just as practical for home use. experience, atlantafastlocksmith.com can assist with any lock or key emergency, rekey locks, provide lockout assistance, and install high-security locks and more. Their services are offered 24-hours a day.